What's your favorite form of Speed Racer Haruka Tenoh/Tenou/Ten'o/10-O! Probably just regular SU. 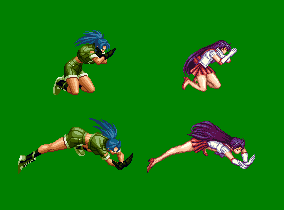 Eternal is horrible looking on her. I picked Sailor Uranus - the 90's butch. I love her princess form, as I do all the girls, but I actually prefer her male presentation to her female one. However, I prefer the manga presentation where she actually has more "male" attributes when presenting herself as a man than the anime where after her initial episode, she looks more feminine even in "men's" clothing. Even though it was unusual, I really did like her one-time use of the mask and the cape. 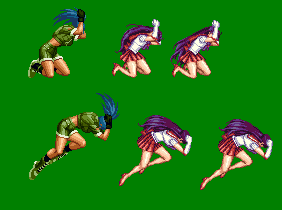 It helped her stand out and I wish we got to see more of that form. As someone who reads Haruka as genderfluid, my personal head canon is that when Haruka is feeling more masculine, they transform into that ~Tuxedo Mask~ Sailor Uranus form, but when they're feeling more feminine, they transform into regular Sailor Uranus. The black mini she wore in Crystal. What a woman she can be. I just really don't like her in Eternal form. It's great that she can look cool in both her feminine & musculine forms, as most women can only do so in either one. I much prefer her as a masculine lesbian like in the 90s anime. I like bith forms, but for me her being gender fluid is better, less stereotype and less offensive. 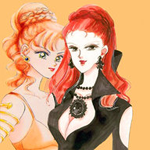 My favorites are the male presentation of Haruka and her original Sailor Uranus form. I like both forms, but for me her being gender fluid is better, less stereotype and less offensive. Why do you consider being gender non-conforming offensive? Butch lesbians exist and aren't stereotypes. Calling butch lesbians "offensive stereotypes" is, in fact, homophobic. Why do you consider being gender non-conforming offensive? Butch lesbians exist and aren't stereotypes. I just thing not complying to a certain role more unique. Why being just a butch when she can be whatever she likes each day. It was very well balanced in the manga. Butch lesbian and Feminine gay guy has become a stereotype in pop culture. Whenever there is a gay/ lesbian couple one f the partners is portrayed as gender non-conforming, which is not always the case. Why being just a butch when she can be whatever she likes each day. So you don't consider "stereotypical" straight people that vast majority of whom are gender-conforming all the time (including yourself, I bet) but have no problem claiming that gay people who are courageous enough to express themselves in a non-conforming way and are socially punished for doing so, are perpetuating offensive stereotypes. That's the definition of a double standard. I've never met anyone like that, I for one (who is gay) wouldn't one day decide to be super feminine one day then the next be super masculine. Everyone kind of picks a style and feel that fits them best and sticks with it, sure they change over the years but its not a night/day change. I just kinda find it strange when she's portrayed as both, it's as if she can't decide where she fits in. I like her 90s anime character who is masculine and isn't afraid to look and act like a man because that's how she feels and wants to be. Since Naoko was a cis-gendered, heterosexual woman living in the relatively conservative country of Japan in the early 1990s when she came up with Haruka's character, she obviously didn't explicitly have the idea of writing a "gender fluid" or "non-binary" character in mind (only for a character who had both masculine and feminine qualities and for whom gender wasn't important), but the end result was a character who can and is today often read that way. Haruka doesn't switch gender presentations every day; Haruka goes through a long stretch of male presentation when we first meet them/her, then through a long stretch of female presentation that I think lasts through the end of Infinity, back to a stretch of male presentation in Dream, and finally another stretch of female presentation in Stars (we see Haruka wearing a female Juuban High School uniform). I think such changes of preferred presentation are fairly consistent with a gender fluid identity. As for the character's 90s anime incarnation... There isn't anything inherently wrong with it. 90s anime Haruka is a butch lesbian, but she's not the most stereotypical butch lesbian either. There's nothing wrong with being a butch lesbian, just as there's nothing wrong with conforming to stereotypes in real life if that's who you are, but we're talking about the portrayal of a fictional character here, and an adaptation of a fictional character at that, and such portrayals are not accidental, nor do they exist in a vacuum. 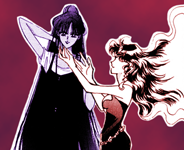 Naturally the changes to Haruka's gender presentation is going to elicit criticism from some fans, as will the butch-femme dynamic of her relationship with Michiru (see also: Kunzite and Zoisite). That's not to say the cishet characters and hetero relationships in this series don't have their share of stereotypes, but that's beside the point: In real life and in fiction, there are literally millions of examples of straight people and straight relationships, so perception of such people and relationships is going to be balanced. But when it comes to queer people and relationships, there is still simply not that much exposure, so there aren't alternative examples to balance out the stereotypical portrayals, and that can lead to people having possibly damaging misconceptions about queer people. That's not to say the stereotypical portrayals of queer characters in Sailor Moon are necessarily damaging/harmful, but they are part of a broader pattern of queer portrayals in mainstream media that warrants criticism. What Sailor Moon does that is damaging is the way it promotes heteronormativity and makes occasional, explicitly homophobic remarks, but that's a topic for another thread. All I wanted to say was there are gay couples where nobody is stereotypically conforming to a role and I like how in the manga Haruka is not the butch stereotype all the time. To be fair even though Haruka does wear female clothes in the manga i cant think of aany instance when she acts feminine, Hotaru even calls her papa.